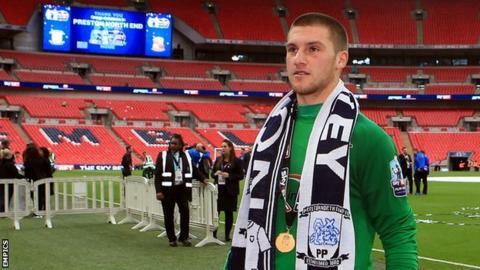 Manchester United keeper Sam Johnstone has returned to Championship side Preston North End on an emergency loan. The 22-year-old was needed back at Deepdale following Premier League side Sunderland's decision to recall Jordan Pickford from a season-long loan. Preston-born Johnstone first signed for North End in January 2015, keeping 12 clean sheets in 25 games to help them win promotion from League One. He returns with Simon Grayson's side stood 17th in the Championship table. As well as being born in Preston, Sam Johnstone's father Glenn played 10 games for PNE in the 1990s. Having re-signed initially for 28 days, up to and including the Derby County game at the end of January, he is available for Saturday's first game of 2016 at home to Rotherham United, who also have former England keeper Chris Kirkland on their books. "My last game here for Preston was at Wembley," said Johnstone, who has also been out on loan at Scunthorpe United, Walsall, Yeovil Town and Doncaster Rovers. "It was a great day, but now we've got to kick on. "It's great to be around the team at Manchester United, but I am 22-years-old and I have to think about myself a little bit and I need to be playing first team football." Preston manager Simon Grayson added: "Jordan has gone back and we would like to thank him for his efforts whilst he was here. It is no surprise, considering how well he has done that they want to have a look at him. "Sam is someone we know very well, who we tried to sign in the summer. We made no secret of the fact we wanted Sam back then and we made a huge effort to get it done. It didn't materialize, but hopefully he'll slot back in now just how he left us at Wembley."